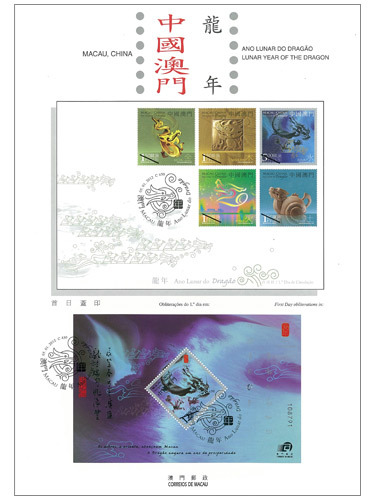 Macao Post will release the fifth issue of the third series of Chinese Zodiac philatelic products with the stamp theme “Lunar Year of the Dragon” on the 5th January, 2012. 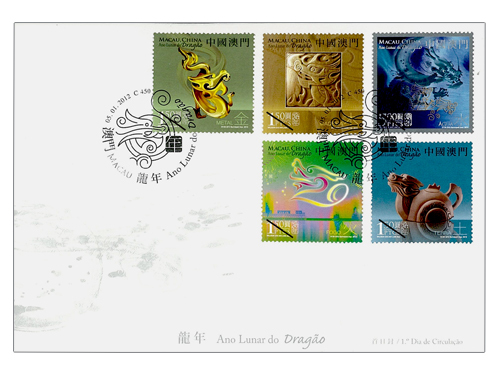 The conceptual design of the stamp is combined with the different forms of the Dragon and the distinguishing characteristics of “Metal, Wood, Water, Fire and Earth”. 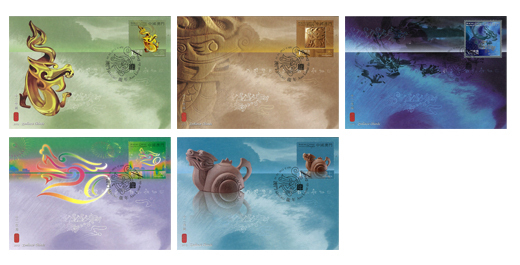 This year, the dragon’s nature from the “Five Elements” is water, so the dragon portrays by the Chinese traditional ink painting becomes the main character of the five stamps. 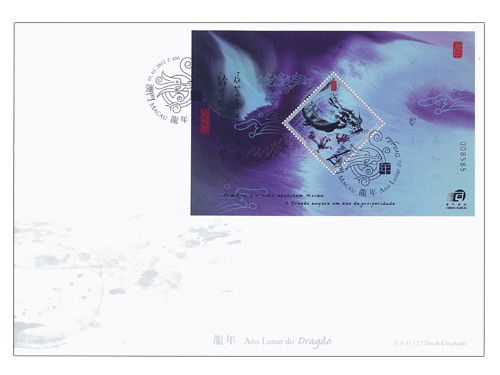 The lifelike ink painting dragon of the stamp applied with the hot foil stamping with holographic, together with the embossed image of dragon boat has highlighted the protagonist of its own. The sparkling silver foil symbolizes the dragon’s nobility, giving the festive spirit of Lunar New Year. This presentation pack contains five stamps, one souvenir sheet, one first day cover with stamps and one first day cover with souvenir sheet of the same issue, this pack is priced at MOP78.00. A prestigious gift box contains an exquisite teapot in the image of “Dragon” and a presentation pack with five stamps of the same issue, priced at MOP388.00. 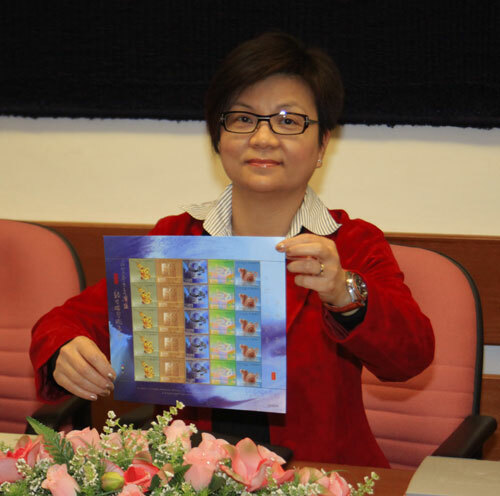 It is certainly the first choice of an elegant gift on this Lunar New Year, and it will only be available for sale at the Philatelic Shop of Macao Post Headquarters. Limited quantity! Get the opportunity to add value to your collection! This is the first stamp issue in 2012. 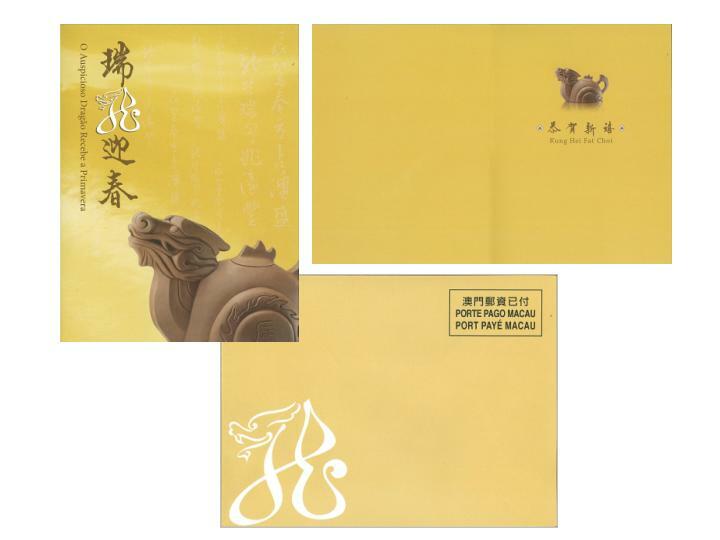 Macao Post will issue a new greeting card for Lunar New Year of the Dragon titled “The Auspicious Dragon Welcomes the Spring”. This card will be available for sale at the Macao Post Headquarters, all post offices and postal kiosks on the 3rd January, 2012. This greeting card priced at MOP8.00 each, can be sent to every corner of the world without stamp. It’s saving your time and money. 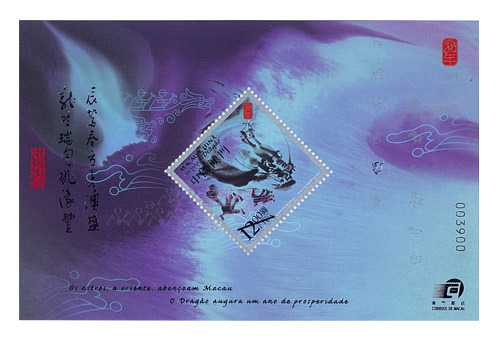 Macao Post will issue the Annual Album 2011 on 5th January 2012, it will be available for sale at the Philatelic Shop of Macao Post Headquarters, “Rua do Campo” Post Office, Maritime Ferry Terminal Post Office, Airport Post Office, and the Communications Museum. An elegant and exquisite protective hard cover portrays a lovely bunny enjoying the peach blossom in a beautiful full moon, symbolizes the arrival of spring, brings a new perspective for the New Year. 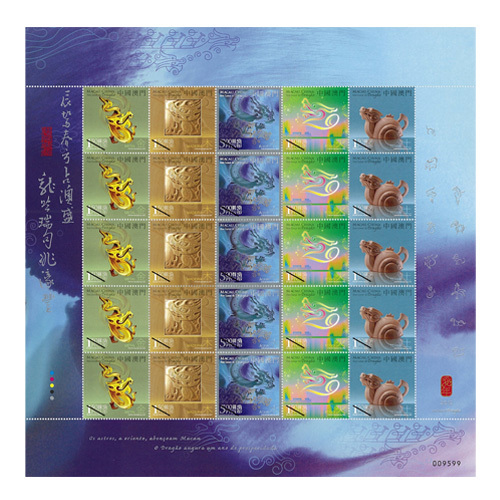 This album comprises the full collection of 2011 stamps and souvenir sheets, on which the colour stamp images and the technical data are printed on the pages. This Album is priced at MOP280.00, it is certainly an excellent product, either as a collectable or as an elegant gift. 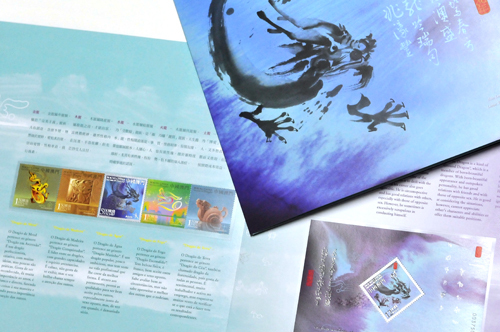 Macao Post will release the “Supplements for Philatelic Album of Macao 2011” on 5th January 2012, it will be available for sale at the Macao Post Headquarters and the Communications Museum. 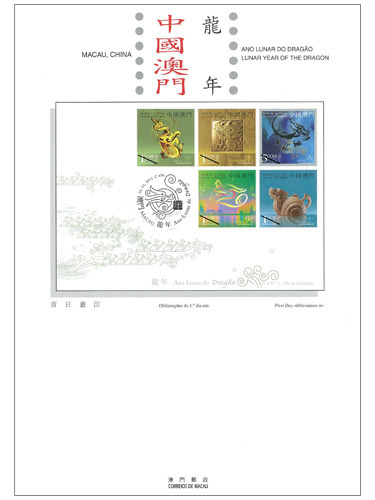 The album pages are pre-printed with all the stamps’ images of 2011. 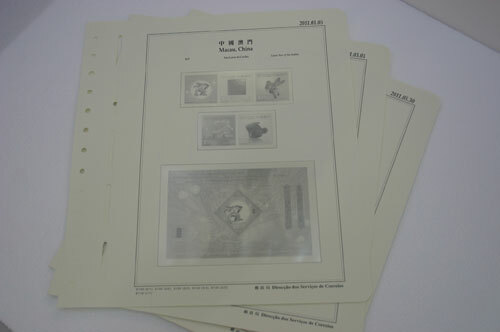 Your collections of stamps and souvenir sheets of 2011 can be put into the pre-printed pages for convenient storage. 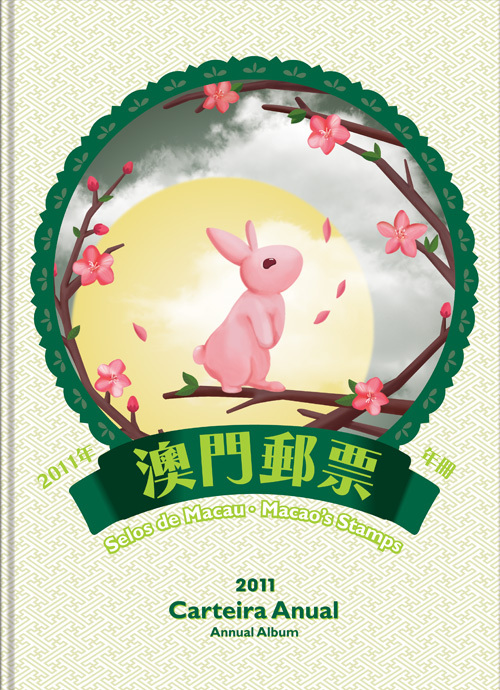 The selling price of Supplements for Philatelic Album of Macao 2011 is MOP200.00. 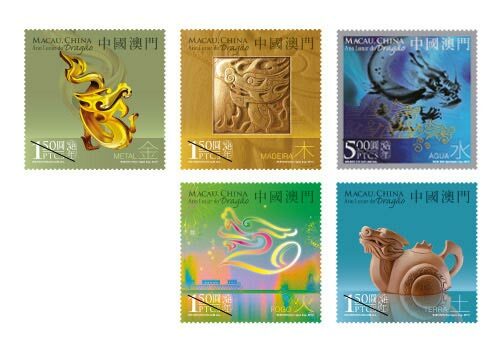 TO celebrate the coming Renchen Chinese Year, Macao Post will issue a lucky ornament titled “Macao’s Lunar Year of the Dragon Stamp” on 5th January 2012. 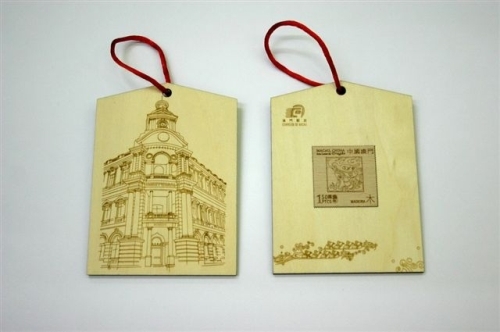 It is engraved with laser techniques for highlighting the Macao Post Headquarters’ building and a thin wooden card with the wood dragon stamp image is affixed on the other side. It is certainly a precious and commemorative collectable. The selling price is MOP 15 and will be available for sale at the Macao Post Headquarters, the “Rua do Campo” Post Office, the Maritime Ferry Terminal Post Office, the Airport Post Office and the Communications Museum. POSTCARD "HIGH MOUNTAINS AND WATERFALLS" – CONTEMPORARY CHINESE MASTERS – SUN JIANG TAO"
Macao Post will issue a set of five postcards titled “High Mountains and Waterfalls” – Contemporary Chinese Masters – Sun Jiang Tao on 20th January 2012, it will be available for sale at the Macao Post Headquarters, all post offices and postal kiosk “Ruins of St. Paul’s”. 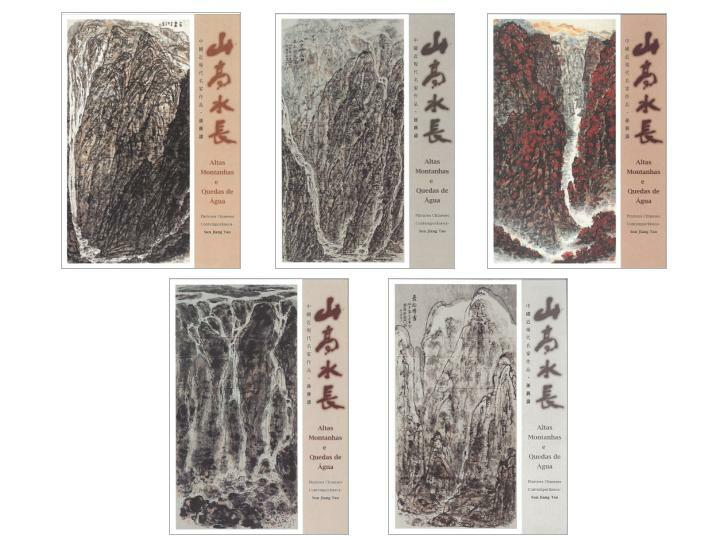 The landscape paintings depicted on the postcards are selected from more than hundred of paintings created by the Macao painter Sun Jiang Tao, with the theme of “High Mountains and Distant Spring”, “Water galloping the rocks in the Mountains on a rainy night”, “Colors of Autumn through the Mountains and Water”, “Water Running in the High Mountains” and “White Snow on a Sunny Day”. 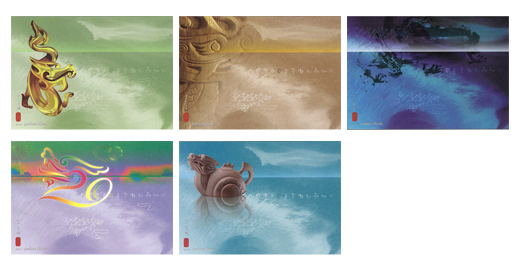 A full set of five postcards are packed in an exquisite cover, the selling price is MOP35.00. Through this set of postcards, messages can be sent to every corner of the world and offering the opportunity to the foreigners to enjoy the spirit of Chinese traditional landscape painting. 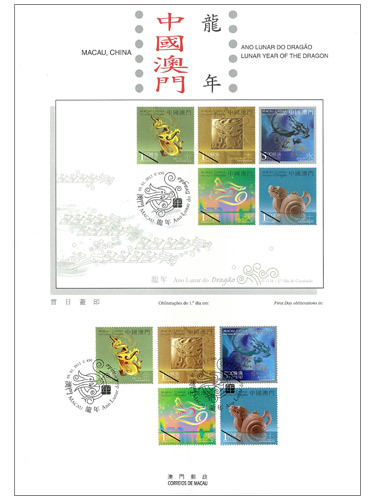 With the service of Macao Post, customers can select his own photos to be printed on personalized stamps “Celebration” in creating a unique stamp sheetlet of his own. It’s a great choice of special occasions for the associations and individuals. 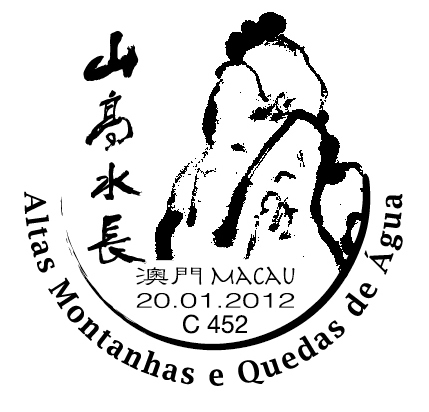 To celebrate the “High Mountains and Waterfalls” Exhibition, Macao Post announces that a Temporary Post Counter will be set up at Tap Seac Multisport Pavilion at 16:30 to 19:30 on 20th January 2012 providing the commemorative postmark cancellation service for the “High Mountains and Waterfalls”. During the above activity, a full set of five postcards titled “High Mountains and Waterfalls” and various philatelic products will also be available for customer’s selection.